With openCRX you get an extremely powerful product management system. You can create a product catalog, including support for complex pricing models. The product catalog supports a large number of products, multiple pricing models, and complex discounting models. In addition, products can be associated with each other through "kits" or "substitute" relationships. A product is either a physical inventory item (like lumber or a nail), or a service (like a hair cut or tree pruning) that a company sells. 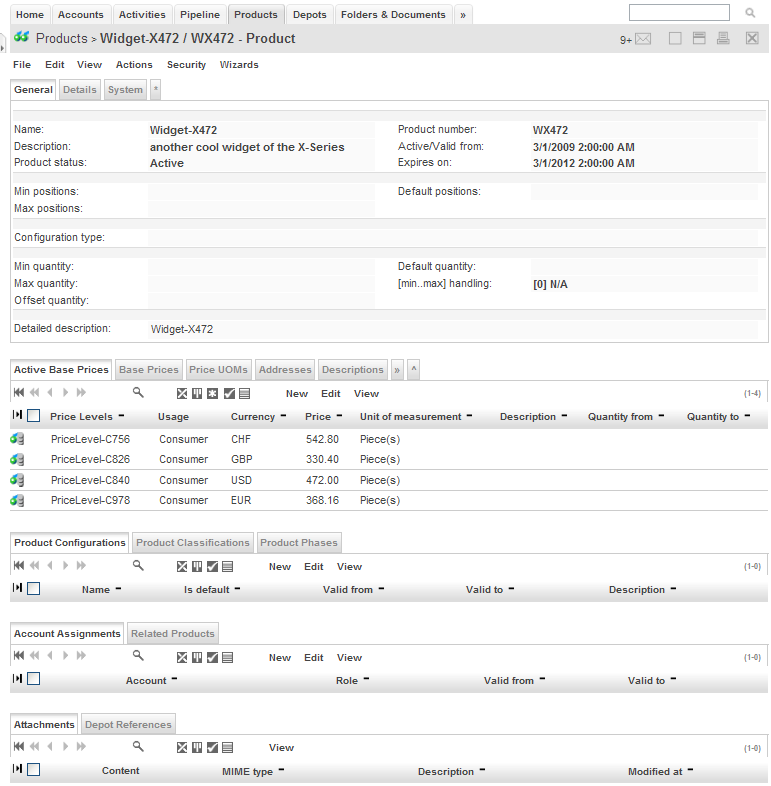 Products from the product catalog can be used to build quotes and orders, and can be associated with opportunities and/or service cases. A product catalog is a collection of products with their pricing information. Price lists contain one to many individual product prices, aggregated together into a list for categorization purposes, allowing for easier maintenance and usability of the list. Units and unit groups contain one to many types of unit of measurement descriptions, as calculated off a base unit. This schedule is then tied to one or many products, which then forms the valid unit group that the product can be sold in. Discounts allow for a product to have different sales prices, depending upon the quantity purchased. A discount list is an aggregation of different discounts, specifying how much of a discount the user can get when the purchasing amount falls between certain ranges. Discount lists can exist at each quantity level, along with detail lines containing the quantity break points, and the reduction in the price. Pricing options are configurations that allow a business unit to control how prices are calculated within the pricing engine. Parameters that can be configured are: Quantity Selling options, Pricing Method, Rounding Policy, and Rounding Option. Stock keeping information, even at different location/warehouses, is also available. For more information about openCRX products please refer to the openCRX Product Guide.